Mrs. Sally Jordan asks her faithful former houseboy, Charlie Chan, who is now a detective on the Honolulu police, to personally transport an extremely valuable pearl necklace from Honolulu to San Francisco that she has agreed to sell to millionaire P. J. Madden through jewelry broker and family friend, Alexander Crawford. Following the completed sale of the pearls, an adamant Madden states, "I want them delivered to my offices in New York and nowhere else." However, when Crawford learns that his son, Bob, had been followed by suspicious characters, and when the elder Crawford receives conflicting instructions Madden to have the pearls brought to his house near the desert town of El Dorado, he becomes suspicious. It is decided that Bob will precede Chan at the millionaire's desert home to make sure that the place is safe. "Blind man feels ahead with cane before proceeding," says the detective, as Bob adds, "And I'm the one to be the cane, right?" On the train to El Dorado, Bob meets Paula Graham, a film director's assistant who is traveling to the same town to arrange a film shoot on Madden's property. As they approach the ranch by a hired car, driven by a local character named Will Holley, they hear two gunshots, and as they near the house, a figure is seen running off. At the house, Bob and Paula are coldly received by Madden's assistant, Martin Thorne, who expresses surprise that Bob has arrived a day earlier than expected. When asked about the gunfire, Thorne suggests that someone in the desert was probably "taking pot shots at jack-rabbits." Bob and Paula are told that Madden is away, while Thorne invites Bob to stay, as Bob has revealed that the pearls will arrive by messenger the next day. The following day, Chan arrives, and to Bob's surprise, he is dressed as a menial, speaking in sing-song broken English, and calling himself "Ah Kim." As the regular cook is away on family matters, Thorne decides, with a well-planted suggestion by Bob, to hire Ah Kim. With the run of the house, Chan begins to search for clues and notices a revolver from Madden's collection that is mounted on a wall has been removed and used recently. In Madden's bedroom, he finds a bullet hole in the wall that has been hastily covered by a painting, and blood stains on the carpet, which someone has also tried to conceal. "Second bullet reposing in victim," states Chan. Bob believes that Thorne has murdered Madden, which Chan believes might be a possibility. Bob and Chan are somewhat shocked when Madden shows up later that day, driven to the house by Thorne. Bob suggests to Chan that, even though the situation is suspicious, they have no choice but to deliver the pearls to Madden as planned. Chan states that certain things should be cleared up before the pearls are handed over, and that Madden should be stalled. Agreeing to follow Chan's idea, Bob continues to put off the delivery of the necklace, finally convincing Madden that the pearls will be delivered on Sunday, two days hence. As Bob leaves a fuming Madden, he suddenly hears a voice crying, "MURDER!" As everyone runs to the source of the screams, Bob is surprised to find that it is a talking parrot. During its dialog, the parrot speaks a phrase in Chinese, to which Chan, in the guise of Ah Kim, replies to the bird. The next day, the "Chinese parrot" is found dead by Chan, who finds that someone used poison to do away with him. Chan feels that the bird had been repeating things that were said during the murder at the house, and that someone had now killed the parrot to stop anyone from hearing them repeated. Later that day, Professor Gamble, apparently an old friend of Madden's, arrives at the ranch. Gamble, Thorne, and Madden then drive into town, leaving Chan and Bob alone at the house. The two men continue their search for clues, turning up more useful information, including some belongings of someone named Jerry Delaney. However, the mystery is far from solved, as Chan and Bob reach no concrete conclusion, except for the possibility that Delaney may have been the murder victim. Chan later heads into the desert, following clues that lead him to the man who had been seen by Bob running away after the gunfire during his arrival at Madden's house on the first night. The detective learns from this person, an old prospector named Hewitt, who had witnessed the shooting while peering through a window, that it was actually Madden who had shot some unseen person. Meanwhile, Bob is in El Dorado sending a telegram to his father. As he prepares to return to Madden's house, he sees Madden's cook, Louie Wong, who has just gotten off of the train, and gives him a lift back to the ranch. As they arrive, Bob sees Chan at the garage and leaves Louie to talk with him. As both men return to the car, they find that Louie has been killed with a knife. When Constable Brackett is called to the scene, he immediately suspects that Ah Kim (Chan) has killed Louie in order to keep his job as cook. However, Bob, protecting Chan's guise as Ah Kim, firmly declares that he was with Chan when Louie was murdered, and Brackett leaves, still unconvinced. On Sunday, the movie crew arrives at Madden's house to do its shooting. During the filming, the director asks Paula to investigate an old abandoned mine in the hills as a possible location site for the next film. When Paula fails to return, Bob has Will Holley drive him up to the abandoned mine. At the mine, Bob calls out to Paula, who calls back. Suddenly Bob and Holley are captured by one of the men who had tailed Crawford back in San Francisco. With a quick move, Bob surprises the crook, named Maydorf, and after a struggle, overcomes him. Reaching Paula, who had been held prisoner, Bob is told that there is another captive being held. Meanwhile, at the Madden ranch as evening falls, Sally Jordan's son, Victor, arrives and ruins Chan's investigation by informing Madden that the detective has had possession of the pearl necklace the whole time he was at the house, and that they should have been handed over days ago. Demanding that Chan hand over the pearls, and showing the detective a note from his mother instructing him to do so, Chan reluctantly complies with Victor's wishes while requesting a signed receipt from Madden. When Madden signs the receipt with his left hand, Chan quickly grabs the necklace and pulls a gun, knowing that the real Madden is right-handed. Brackett suddenly arrives on the scene and, believing that Chan is in the process of robbing Madden, fails to pay any heed to Chan's protests to the contrary. Just as Chan is forced to hand the pearls back, the real Madden, with his arm in a sling and dried bloodstains on the shoulder of his shirt, suddenly walks in with Bob, Paula, and Holley, who has a gun in Maydorf's ribs. After a quick struggle, the false Madden, who is a look-alike and actor named Jerry Delaney, and who had attempted to impersonate Madden years earlier as part of a racket in New York, is subdued. Madden then rightly accuses Thorne of having double-crossed him. As he tries to slip away, Chan stops professor Gamble, revealing that, hidden on his person is the knife that was used to kill Louie Wong. With the case solved, and the pearls safely in the hands of their new owner, Chan, Bob, and Paula take the train out of El Dorado. On the rear platform, Paula and Bob are seen embracing as the train leaves. NOTES: This is one of the four "lost" Charlie Chan films, having been destroyed in the fire that consumed the 20th Century-Fox film storage facility at Little Ferry, New Jersey on July 9, 1937. 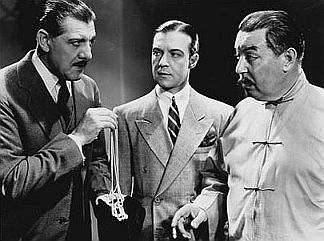 An illustrated script-based reconstruction of Charlie Chan's Courage can be viewed at our collection of "lost" Charlie Chan films. Sources conflict concerning the credits for director and cameraman. While production charts list both George Hadden and Eugene Forde as directors and Arthur Miller as the cameraman, reviews and the Fox trade paper advertising billing sheet credits only Hadden as the director and lists Hal Mohr as the cameraman. According to a press book for this film, this was Hadden's first directorial assignment; he had been theatrical producer David Belasco's "right-hand man" during the last six years of Belasco's life, and had worked as a dialog director in films. According to the Motion Picture Herald, some scenes of Charlie Chan's Courage were shot in the Mojave Desert. In 1927, Universal Pictures produced a film, based on the same source, entitled The Chinese Parrot, directed by Paul Leni and starring Marian Nixon with Kamiyama Sojin portraying Charlie Chan. Always pleasant journey which ends among old friends. Blind man feels ahead with cane before proceeding. Setting hen squats cautiously on thin egg. Much fuel tempt man to build fire. Large sugar bowl draws many flies. Always danger where men are evil, but knowledge best weapon for protection. Must not too soon come to conclusion. Too many mixed drinks make big headache. Man who does not listen at keyhole never gets earache. Man's soul is lost that does not grieve the death of faithful servant. Left-handed man always uses left hand. Anxious man hurries too fast and stubs big toe. Round-about way often shortest path to correct destination. Inscrutable fates reveal steps toward true solution. Done from 'The Chinese Parrot,' this is one of the least successful of the Charlie Chan series. Without Warner Oland it would probably drop to the sort of story the indies sometimes make with much the same plot. Oland works hard to lift the action, but with no great success. The script lingers too long over the introduction and when it does pick up a little acceleration, the quickening comes too late to whip up interest which has largely flagged through the long drawn out exposition. Even Oland is handicapped by a script which requires him to assume the disguise of a Chinese servant and largely stand around and snoop over a murder. He is suave, he reels off Chinese adages and he looks mysterious, but he is seldom able to create momentary suspense. The story fairly ambles along to its conclusion with Chan contributing nothing to the discovery of the criminal. It's a tough assignment. Story revolves around a pearl necklace which is sold for delivery to a millionaire at his ranch. Chan brings the jewels from Honolulu. The son of the woman who offers the necklace goes to the ranch with the understanding that Chan will follow and make delivery if all is well. All isn't well. A murder has been committed just as the boy drives up with a girl location scout. They hear shots, but can find no clew. Chan follows and engages as a servant. After that he is chiefly engaged in looking suspicious while the residents of the ranch glower and act mysteriously. Apparently the part of the girl has been added for romance, but there is little of the romantic and that not interesting. Girl is played by Drue Leyton, who does her best. Donald Woods makes a stiff juvenile lead. Some of the bits are better played than the leads, but no program credit is given. Story will please mildly in the lower brackets. It's not de luxe material. SALLY JORDAN'S COMMENT REGARDING P.J. MADDEN: "...the Wall Street plunger..."
THE TREASURED NECKLACE THAT WAS A GIFT FROM HER FATHER, MR. CAVANAUGH, THAT SALLY JORDAN WAS NOW SELLING: The "Cavanaugh Pearls"
ALEXANDER CRAWFORD'S ASSESSMENT OF THE PEARLS: "That necklace is one of the finest sets of matched pearls in the world. It's worth a half million on today's market." WHEN THE NECKLACE WOULD ARRIVE FROM HONOLULU, ACCORDING TO SALLY JORDAN: "Thursday morning." ACCORDING TO P.J. MADDEN, WHEN HE WOULD LEAVE SAN FRANCISCO FOR EL DORADO: "...this afternoon..."
ACCORDING TO P.J. MADDEN, HIS PLANNED TIME TO LEAVE EL DORADO FOR NEW YORK: "After a few days..."
P.J. MADDEN'S TERMS FOR THE PURCHASE OF THE CAVANAUGH PEARLS: "...fifty thousand down...the balance within thirty days of delivery." ACCORDING TO MARTIN THORNE, THE LENGTH OF TIME THAT HE AND P.J. MADDEN WOULD STAY IN EL DORADO: "...until Saturday..."
P.J. MADDEN'S DELIVERY INSTRUCTIONS FOR THE PEARLS: "I want them delivered to my offices in New York and nowhere else." P.J. MADDEN'S PAST, ACCORDING TO HIMSELF: "I used to be a bellboy in the hotel where (Sally Jordan) gave (her) parties." CHARLIE CHAN'S JOB WITH SALLY JORDAN DURING HIS EARLY YEARS: "...(Sally Jordan's) number one (house) boy." ACCORDING TO SALLY JORDAN, THE NAME OF THE SHIP THAT CHARLIE CHAN TOOK FROM HONOLULU AND HIS ARRIVAL DAY IN SAN FRANCISCO: "Thursday morning on the President Pierce." A DESCRIPTION OF THE CAVANAUGH PEARLS: "...a gorgeous triple string containing about one hundred and fifty large and exquisitely matched pearls." ACCORDING TO WILL HOLLEY, THE DISTANCE FROM EL DORADO TO P.J. MADDEN'S RANCH: "...twelve miles each way..."
ACCORDING TO WILL HOLLEY, THE AMOUNT OF GASOLINE REQUIRED TO MAKE THE TRIP IN HIS CAR: "...a gallon and a half..."
ACCORDING TO WILL HOLLEY, WHERE LOUIE WONG HAD GONE AND WHY: "Louie went to Los Angeles yesterday (Thursday)...he inherited some money." ACCORDING TO WILL HOLLEY, THE TYPE OF GUNSHOT THAT WAS HEARD AS THE GROUP APPROACHED P.J. MADDEN'S RANCH HOUSE: "Sounded like a forty-five." P.J. MADDEN'S WHEREABOUTS, ACCORDING TO MARTIN THORNE: "...he's in Palm Springs." ACCORDING TO MARTIN THORNE, WHEN P.J. MADDEN WAS TO RETURN: "...tomorrow noon." ACCORDING TO CHARLIE CHAN, THE ROUND-TRIP DISTANCE FROM P.J. MADDEN'S RANCH TO PALM SPRINGS: "...ninety miles." ACCORDING TO P.J. MADDEN, HOW HE CAME TO ACQUIRE TONY THE PARROT: "A sea captain gave him to me five years ago." ACCORDING TO PROFESSOR GAMBLE, THE PROBABLE CAUSE OF TONY'S DEATH: "Probably hypertrophic cirrhosis." THE NAME WRITTEN ON THE ABOVE LABEL IN INK: "JERRY DELANEY"
ACCORDING TO CHARLIE CHAN, THE INFORMATION REGARDING THE RAILROAD TICKET PRESUMABLY BELONGING TO JERRY DELANEY: "Chicago to Palm Springs...purchased February 8th." THE DATE OF JERRY DELANEY'S ARRIVAL IN EL DORADO, ACCORDING TO BOB CRAWFORD'S CALCULATIONS: "That would get him to Palm Springs on the 11th...Wednesday...the night before I got here." ACCORDING TO CHARLIE CHAN, THE TYPE OF POISON USED TO KILL TONY THE PARROT: "...arsenic." PAULA GRAHAM'S PLANNED TIME OF HER RETURN FROM THE ABANDONED MINE: "...about three (p.m.)"
PAULA GRAHAM'S EXPRESSED KNOWLEDGE OF EDDIE BOSTON: "I hear he used to be a gambler in New York." P.J. MADDEN'S FINAL DEADLINE FOR THE PEARLS TO BE DELIVERED: "Eight o'clock (Sunday night)..."
CHARLIE CHAN'S STATED POLICE RANK: "I am Detective Sergeant Chan of Honolulu Police." ACCORDING TO P.J. MADDEN, JERRY DELANEY'S OLD PROFESSION: "He used to be an actor..."
Bob Crawford: "...a hard looking bird followed me down there..."
chamois - A soft leather made from the hide of this animal or other animals such as deer or sheep. Charlie Chan: "Note chamois lined watch pocket." chock-gee - (From Chinese) Certificate proving legal resident status. Following the Chinese Exclusion Act of 1882, there were very strict immigration limits placed on the Chinese. These laws, which were expanded, were in place until repealed in 1943. During this era, it was not uncommon for persons of Chinese decent, even though they may have been born in the United States, to carry papers proving their legal status. Constable Brackett: "Where's your chock-gee." Bob Crawford: "...I came down to meet the Dowager Empress of Siberia, but they tell me she's dead." Man: "Well, the closest thing to it is a flivver across the street." Charlie Chan: "Suggest giving Madden hoo-mali-mali until mystery cleared away." Professor Gamble: "Probably hypertrophic cirrhosis." Bob Crawford: "I'm sorry that you have to put up at that one-horse hotel." Sally Jordan: "The Wall Street plunger?" President Grant - Built in 1921, one of the ships in the Dollar Steamsip Line (later, the American Presidents Line) that carried passengers to and from Honolulu, throughout the Pacific, and around-the-world during much of the twentieth century. Sally Jordan: "Thursday morning, on the President Grant." Constable Brackett: "And I'm the Queen of Sheba." Professor Gamble: "Have you ever studied the Sauromalus Ater?"